Portable Travel Walker with Wheels and Fold up Legs . 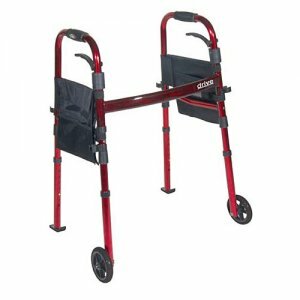 The Drive Medical Portable Folding Walker in red easily folds, tool free, to half the size of a traditional walker and can be stored in a "Ready Set Go" pouch that is provided with each walker. The legs are attached with strong elastic cords making it easy to fold flat, for easy storage and transportation. When the walker is opened, two side pouches with large pockets for personal items are held in place by Velcro tabs to both side frames. The 5" front wheels and rear glide skis provide a smooth transportation over most surfaces. Inside Hand Grip (Width): 17"; Inside Back Legs (Width): 22"; Width: 26.5"; Base Opened (Depth): 20.5": Height: 29"-37"; Product Weight: 7.9 lbs.